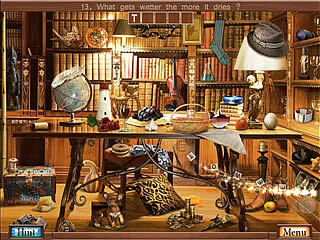 Hidden Object Crosswords is a mixture of two game ideas. And I guess I don't have to tell you which two because you can tell from the title of the game. The game is like a fresh breeze for those who play a lot even though the components of the game are same old hidden object and crossword puzzles. There isn't any story to back up what you are going to do here. One thing that experienced players should have noticed or at least got a feeling of it is that the title of the game only tells the game genre, nothing more. Don't you usually have a name of a person or location in the title? Yes, you do. But only when there is a story to the game. In this case there isn't any story to back up what you are going to do here. And what you are going to do here is exactly what the title tells you. So how does it work? 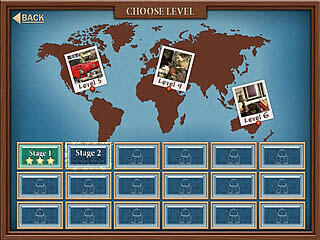 You are to go through 18 stages in this game. Each stage consists of three levels, which makes up a total of 54 levels. Each level in its turn includes two parts. One of them is a hidden object scene and the other one is the crossword puzzle. So you choose a word on the crossword grid that you want to write in. The game gives you a hint for that word. Then if you know what that item is, you go and search for it on a cluttered scene. In this way you get the whole crossword puzzle solved. Or if you are not really interested in the idea of filling up the crossword, you can just use the arrows at the top of the screen to see the clues for items to find. Some of the clues are more difficult than the other ones, but they are more fun that just a list of items. The game is supplied with the hint system to not let you get lost. But the hints are not always very helpful, but still... 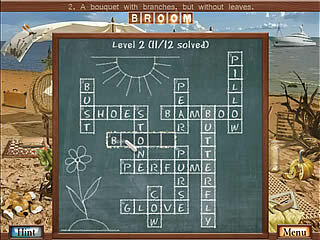 The graphics in Hidden Object Crossword are not shocking with their beauty, but quite acceptable. This is the game in a nutshell. You get the idea of what you will get here, but check out the trial version if you are still not sure. This is Hidden Object Crosswords review. Download this game here.